EAFM is the initial hemodynamic resuscitation of patients with septic shock by administering fluids during the first 6 hours after the initiation of therapy. Most studies looking at treatment of septic shock define achieving the early goal as giving 25 to 50 mL/kg (on average 30 mL/kg) of fluids given within the first 6 hours. The recent surviving sepsis campaign guidelines define EAFM as 30 mL/kg given in the first 3 hours. However, it has been hypothesized that fluid resuscitation using such large volumes of fluid lead to “iatrogenic salt water drowning” and that more conservative strategies for fluid resuscitation might be warranted. LCFM describes a moderate fluid management strategy following the initial EAFM in order to avoid (or reverse) fluid overload. Recent studies showed that 2 consecutive days of negative fluid balance within the first week of the ICU stay is a strong and independent predictor of survival. LCFM must be adapted according to the variable clinical course of septic shock during the first days of ICU treatment, e.g. patients with persistent systemic inflammation maintain trans-capillary albumin leakage and do not reach the flow phase (see further) mounting up positive fluid balances. LGFR describes that in some patients more aggressive and active fluid removal by means of diuretics or renal replacement therapy with net ultrafiltration is needed either or not in combination with hypertonic solutions to mobilize the excess interstitial edema. This is referred to as de-resuscitation, a term that was coined for the first time in 2014. With respect to the different phases of fluid resuscitation (early vs. late) one can classify the dynamics of fluid management by combining early adequate (EA) or early conservative (EC) and late conservative (LC) or late liberal (LL) fluid management. Based on this theoretical concept, four distinct strategies can be defined: EALC, EALL, ECLC, ECLL. The EALC and ECLC groups carry the best prognosis. This refers to the initial phase of septic shock when the patient shows hyperdynamic circulatory shock with decreased systemic vascular resistance due to vasodilation, increased capillary permeability, and severe absolute or relative intravascular hypovolemia. Fluids are mandatory and lifesaving in this phase. The patient in this stage needs EAFM. This refers to the phase of septic shock after initial stabilization where the patient will mobilize the excess fluid spontaneously, a classic example is when a patient enters a polyuric phase recovering from acute kidney injury (AKI). In contrast to the “ebb” phase, the "flow" phase refers to the time period after acute circulatory shock has been resolved. In this post-shock phase, the metabolic turnover is increased, the innate immune system is activated, and a hepatic acute-phase response is induced. This hypercatabolic metabolic state is characterized by an increase in oxygen consumption and energy expenditure. 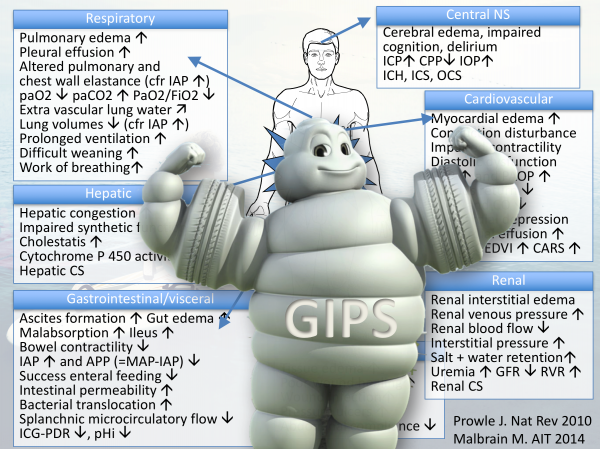 Some patients will not transgress to the “flow” phase spontaneously and will remain in a persistent state of global increased permeability syndrome (GIPS) and ongoing fluid accumulation. This is referred to as ‘the third hit of shock’. In this lecture given by @manu_malbrain during the 38th #ISICEM18 meeting held in Brussels the above mentioned concepts are explained and discussed. Malbrain ML, Marik PE, Witters I, Cordemans C, Kirkpatrick AW, Roberts DJ, Van Regenmortel N: Fluid overload, de-resuscitation, and outcomes in critically ill or injured patients: a systematic review with suggestions for clinical practice. Anaesthesiol Intensive Ther 2014, 46(5):361-380.